To fly online with VATSIM, you will need to download and install a software application which connects your Flight Simulator with the VATSIM servers. There are several such applications, and all are free. Clients are available for FSX, FS9, P3D and X-Plane. These applications also enable you to communicate with ATC and other aircraft. To do this, a headset with microphone is very useful, but not required. Text communication is always available. For model matching, you can use SPAI or another AI traffic, you don't need to download from VATSIM's model matching.. Currently all Pilot clients are written for Windows except XSquawkbox which is only used for X-Plane and can be used in Windows, Mac OS and Linux. (FSX or P3D only) vPilot is a simple, effective client designed to get new pilots flying quickly with excellent model matching so that you can see other online pilots with the correct aircraft type and livery. Generally, it's 5-10 minutes from download to working, including setting up your model matching. Documentation is thorough. vPilot was recently released and is supported by not only the community but by the developer who continues to make feature improvements. (FSX, FS9 (2004), FS2002) Squawkbox is an older, but still effective pilot client. Squawkbox is no longer supported by the developer, although community support is available in the VATSIM forums. (FSX, FS9 (2004), FS2002) FSInn is also an older, but yet effective pilot client. It has a number of features including a traffic radar screen, a push-back feature and the ability to configure model matching so that you can see other online pilots with the correct aircraft type and livery. The setup can be a bit tricky, but well documented; all of the information regarding FSinn and FScopilot is contained in a very good user manual. 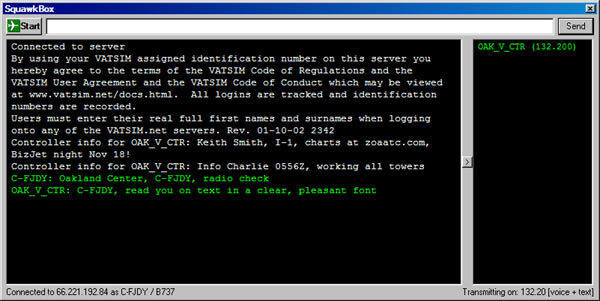 FSInn is no longer supported by the developer, although community support is available in the VATSIM forums. (X-Plane only) XSquawkbox is currently the only client to connect X-Plane with VATSIM. X-Plane is an alternate Flight Simulator product to Microsoft Flight Simulator products and Prepar3D and can run on Windows, Mac OS and Linux. The download includes installation instructions.